The easterlies returned and, whilst it didn’t bring a big fall, it brought a promising enough selection of birds to make for a good day’s birding in the sunshine. A Red-backed Shrike on Dronger was the first of the year, a Grey-headed Wagtail at Utra was also new in (and there was also a Yellow Wagtail and two unidentified flava wagtails), whilst increases in several common migrants were headlined by 6 Spotted Flycatchers, singles of Black Redstart, Redstart, Whinchat and Blackbird, 5 Woodpigeon and small increases in most warblers, with totals of 8 Sedge Warbler, 8 Whitethroat, 2 Garden Warbler, 4 Lesser Whitethroat, 7 Blackcap, 8 Chiffchaff and 4 Willow Warblers. There were also decent numbers of hirundines around, with 101 Swallow, 14 House Martin and a Sand Martin. 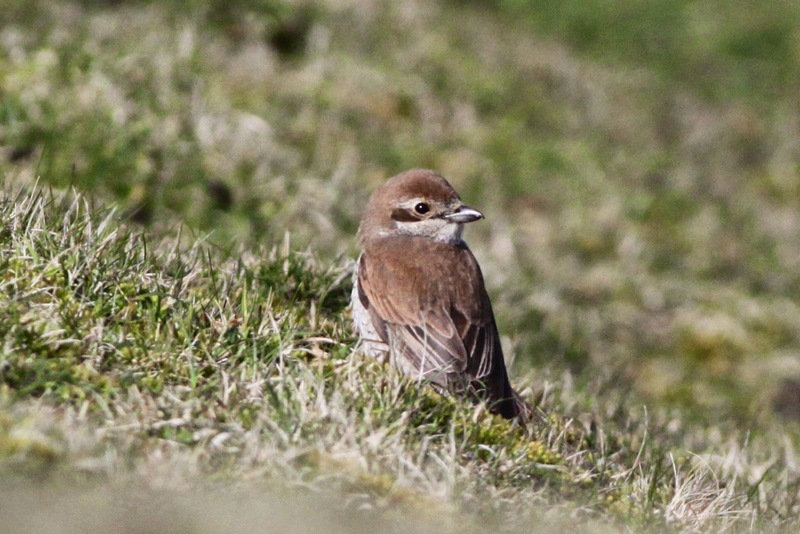 The first Red-backed Shrike of the year was found on the sheltered west coast of Dronger. Raptors were well represented, with an Osprey seen coming in over Malcolm’s Head (our bird from yesterday, or the one seen leaving North Ronaldsay about an hour and a half previously? Or perhaps all the sightings are of the same individual anyway), along with Merlin, Sparrowhawk and 2 Kestrel. On top of all these birds, lingering regulars were represented by Caspian Stonechat, 2 Western Subalpine Warblers (the male reappearing at Burkle and the female still at the Obs), Kumlien’s Gull and a reappearance of the Short-toed Lark on Malcolm’s Head, which had gone missing for a week. The breeding season continues to advance, with Fair Isle Wrens and Pied Wagtails seen carrying food, whilst Ravens have almost fledged and most seabirds are now on eggs. Ah, the glorious 20th. Happy days of 2012!